Do you really want to uplift your business and get high ranking in Search Engines in the shortest amount of time? So, bear in mind, Powerful original Web 2.0 backlink are another link search engine values and indexes as quick as a flash. And, drive high-quality and organic traffic to your website. 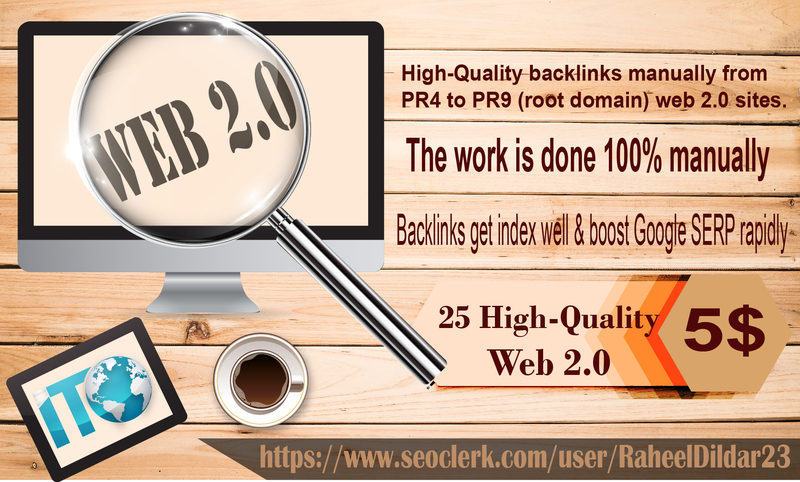 We commit to give you high-quality backlinks manually from PR4 to PR9 (root domain) web 2.0 sites. We always love to be committed & hate makes fake promises. First, we always ensure our client's trust then make long-term working relation. Google Hummingbird, Panda modernize friendly & will forever secure on futurity as search engines love web 2.0 shared content. Wait Wait! We have an interesting offer for you, we will give you 10 Niche Relevant contextual comments on high PA DA & Real TLD sites (Wow). create 10 web 2.0 submission from High PR sites manually is ranked 5 out of 5. Based on 3 user reviews.